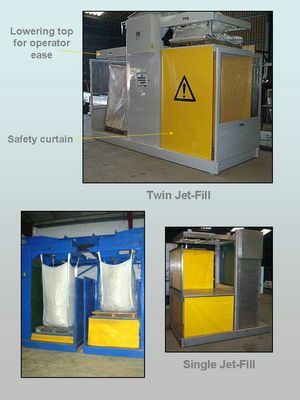 The Jet-Fill is a high capacity machine for filling big bag of up to 1200 kg capacity. Belt powered platforms lift empty bags to a reversible conveyor which feeds the crop into it. As the bag fills crop sensors lower the bag platform until the bag is full and the conveyor belt stops and reverses to fill the bag on the other side of the machine. When the bag is full the bag platform lowers further so the bag is suspended by its handles. the bag stretches so the crop is correctly in the bag. The bag will then sit correctly on a pallet. The platform t hen lifts the full bag a little and solenoid rams release the bag handles. The bag can then be removed on its pallet by a forklift. The semi automatic cycle continues as long as filled bags are replaced by empty ones. For Health and Safety working the attachments for the bag hooks are automatically lowered so the operator can attach an empty bag whilst standing on the floor. Customers should be aware that other, less expensive machines do not have this and there is doubt over them meeting EC safety regulations. Elecctrical controls include a micro processor, crop sensors and micro switches. There are manual over-ride buttons in the electric panel door.